That is good solid common sense combined with advanced post-graduate Old School study and modern kit. Being strong across the cadence range is a good thing then/now but it takes dedicated work, or winning the genetic lottery. The modern TT machine is a marvel of aerodynamics and bio-mechanics but it must take considerable adaptation to be able to hold a proper position while putting out big power, high speed and being firmly in control for the duration of the event. ( If someone would let my local Triathletes know that the latter is a requirement for operating a bicycle on the open public roads I would appreciate it.) Time and effort well spent yesterday out on the TT bike instead of dreadful Sisyphean indoor struggles with a virtual boulder and hill. 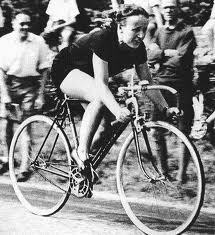 I wonder how fast Beryl Burton would have be able to have gone on a modern TT machine? Very, very Fast no doubt. I would think so as well. Also, we learned in a wheel thread on the road forum from a wheel salesman that equipment does not make any difference and the best racer wins. Maybe I will just start riding time trials Merckx style on traditional round tube steel frames, gonzo spoke count wheels with a leather helmet and toe clips and straps with metal cleat nailed to the bottom of my shoes. I used to have the Victoria shoes with wooden soles that I had to nail cleats on the bottom. Also, we learned in a wheel thread on the road forum from a wheel salesman that equipment does not make any difference and the best racer wins. If I had the benefit of the deep profound "learning" that the 41 provides back-when I could have saved myself considerable time, effort and expense in the futility of preparing for and actually lining up to contest races that I could not possibly win, not being the designated "best racer". By some remarkable fluke of happenstance the "best racer" apparently had an appointment with destiny elsewhere on a few occasions and steps on the podium were occupied by the merely competent who had wasted a day showing up to defy inevitable defeat. In 41 World are "best racers" given their magical race bikes by a divine being like the Lady of the Lake bestowing Excalibur on young Arthur exhorting them to "Sprint, Climb and TT Like No Mortal Cat 5 for thou shalt need no frame of shaped aerospace materiel, spokes of low count or electrical shifting for thou art The Best Racer ". Or is the anointing process somewhat more prosaic like on American Idol? Last edited by Bandera; 01-23-19 at 04:29 PM. Old school or new school...water bottle filled with lead shot and carried up long climbs to make roadies better climbers and sprinters donning weight vests who want to improve their standing starts? No worries. External load is the work you do. Internal load is the impact it has on your body. Thanks. Makes sense but I'd never heard those terms. Here is another old school training protocol that is very adaptable for trainers - 3x10minutes 30"on/30" 4-5' rest between intervals an one can add another set of 3x10 to make it harder. According to my track coach, it was developed by the Russians to improve threshold and fable goes that they found it to be the best use of time. One of the theories for why it works is that there is an aerobic carryover from the 30 second on period to the off period such that one gets the benefit of riding VO2 for 10 minutes. The counter by some coaches is that there is not enough constant force to drive adaptive change and that a better protocol is 2.5 minutes at VO2 and then one gets the addition 30 second carry over so that the effort is really 3 minutes. And of course the other advantage is that one is mixing power producing systems versus training at constant power. As a kid, I was a 200 meter and 400 meter runner at track and field. So 30 second or 1 minute power is my sweet spot so I eat these up. My nemesis is constant power for longer periods of time. Here is my workout from today that starts with a warmup and then 30/30. I ride the high power portions in the drops and target greater than 120% FTP for the 30 second on portion and z2 for the lower limit. I do not coast. I did these on Fiesta Island that is somewhat windy and flat and is a 4.1 mile circumference. This workout makes me a believer that time is not constant. Time slows down during the 30 second on portion and speeds up during the 30 second off portion. Also, the first 3 hard efforts feel easy. As time goes by, the 7-10 efforts feel much harder for the same power and breathing much more labored. Fortunately, I just glance at my power meter to keep the power up during the final efforts. Last edited by Hermes; 01-24-19 at 06:04 PM. I went out on the fixed gear for about an hour and a half. Maestro, classic old school workout. I try to do this at least once each week. Only more so as the Alveoli exchange gas without their old vim, vigor and youthful 'Elan. Sounds like Team Alveoli are a bunch of old farts needing a good coach! Do this. 1 x 120 if you have time today. If you don't have two hours today but can do 90 minutes today and tomorrow then do that. If you only have 90 minutes today then do 6 x 10 tempo today. If you don't have 90 minutes, then do 4 x 8 SST. Recover. Repeat. 1x120 at what intensity? And for what purpose? Is two days at 90 min each equivalent to 1 day at 120 minutes? Based on what? Who says? How is any such equivalancy designed and more important, validated? In other words how did you draw that conclusion (for example), and how can we check that it is good guidance? Is it intended to be indoors? I have nothing against 2 hour bike rides, but ... indoors? This seems totally out of any context save what might exist in the brain of fstrnu, and what makes that relevant to me, or anyone else? Well I agree OP, but not necessarily for the reasons listed. We have become way too dependent on our machines constantly looking to them for guidance and inspiration, and that has made us fat and lazy. If not physically, then mentally. You're not the first here to recommend it, but its good to take some time off to unplug, and just "enjoy" the ride. That's not at all what's he's recommending. He's recommending you follow his archaic, made-up, generic "plan" in which you stare at numbers on your bike computer screen for hours on end in your basement in the hopes that you'll zero in on specific factors that will "change" in a manner that might indicate a potential fitness gain. It's the opposite of unplug. It's the fourth circle of a rider's inferno. How do you folks have the energy to post here after riding three 200km nonstop training rides on one water bottle and no food this week? Not to mention time on the track bike in the velodrome. How do you expect to be ready for the Spring Classics? And you'd better switch to those soft, cushy 700x23 tires pretty soon or those cobbles will eat you up. I have no plan I just ride my gravel bike on flats, descents, and hills I figure that will cover the basics. I use a Cateye Velo 7 and keep a record of time and mileage and the route I took. I try to ride a minimum of 100 miles a week. Plus 3.9 km walk to get dinner. The cycling was surprisingly tiring for me for some reason. 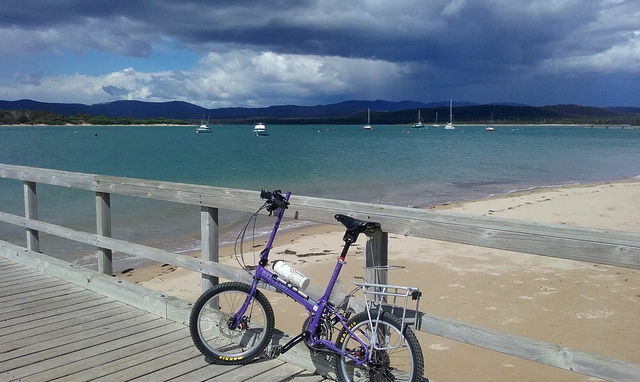 It was a great ride, enjoyed it, but my fitness level has deteriorated. Plus a slow 4 km walk. For a new cyclist, smart trainers can be a good way to keep them engaged in riding where weather prevents them from riding outside by using programs like Zwift to be more interactive. You can do the same thing though with a dumb trainer and speed sensor. New cyclists need volume and they need to keep riding through out the year to keep from falling backwards. To me that's what smart trainers do. You can do trainer road type training from a canned program on any trainer, it doesn't have anything to do with smart or dumb trainer really. Canned program structured training keeps people engage riding with purpose though too so those are good in that respect I would say. The only issue I have seen with them is the aren't as specific as I would do, they tend to move from system to system - perhaps to keep people interested? My work right now is steady state intervals 3/week (60 minutes at intensity),a 2 hour endurance ride on the weekend and 2 recovery spin days in between the interval days - probably will be that for the next couple months at least in blocks of 3 weeks. That's the system specific work I see missing from the canned programs you mention. Last edited by srode1; 02-10-19 at 06:14 AM. You want all your sessions to elicit a cardiac drift of 5-10%, except for the first of your 2 x 1 x 90. You must not know me very well. I don't do any structured training, I just ride...70% of my yearly miles are done on my fixed gear bike and the other 30% on a single speed MTB...I don't use any apps and I don't own an indoor trainer, all of my riding is done outside. You haven't told us anything ... like your goals, for example. Why? What is the principle behind this? Out on the winter/wet bike, another artifact of the Old School, for an hour or so. Fitted out with full mudguards, 28mm tough tires and storage for a rain jacket it's a machine dedicated to still going out on the bike on sloppy/lousy days. Nasty weather today my gravel bike is caked with caliche from yesterday.